Direct - Plagiarism Checker X version 6.0.6 -=TeamOS=- | Team OS : Your Only Destination To Custom OS !! 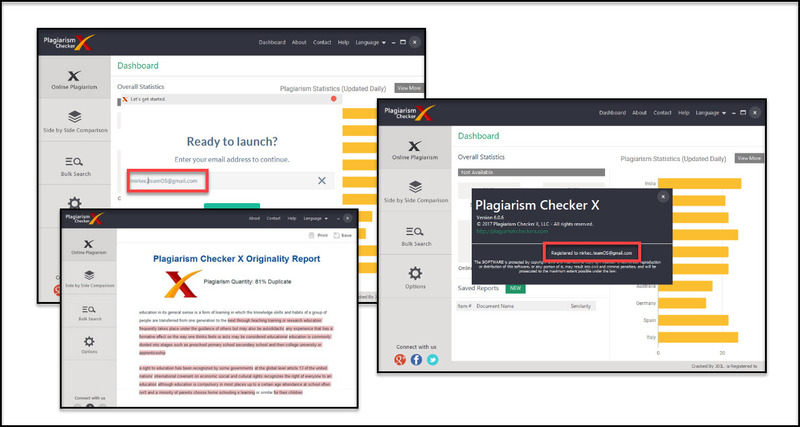 Plagiarism Checker X is a practical and useful utility whose primary purpose is to help user check and locate similar content inside text documents and web pages. A user can select materials to scan for plagiarism and quickly check the contents of a webpage to see if it is copied from somewhere else. The utility is specially intended for users including teachers and students who need to find out the percentage of plagiarism and original data over the Internet. It scans entire user documents and displays the results in seconds. It takes a few seconds to calculate and show the percentage of the copied material along with the web sources. After the scanning process is finished, the utility prompts a user with a small message box that allows him to open the report. This way, a user can view the total number of identified sources and the copied words. Another feature that comes in handy is the ‘Side by Side Comparison’ option that allows a user to swap content between two windows and locate the copied content effortlessly. However, if a user does not want to check the entire document but specific keywords, then he can easily use this option, too. A user can extract some keyword phrases from documents and view their occurrences and density percentage. Furthermore, a user can even scan multiple repositories of materials and get notified which papers are plagiarized. It provides a user with three methods such as Simple, Selective and Cross Comparison. The first method allows a user to check out the plagiarism rate of one document reported to multiple records, while the last one contains only one repository and finds all the duplicate content by checking each document with the rest of the existing files. Our basic feature detects plagiarized content through multiple search engines. The result is that user documents are scanned through 16 Billion+ indexed web pages. A handy option that allows a user to swap own content between two windows and locate copied content effortlessly. Editors and SEO Analysts will love this feature. 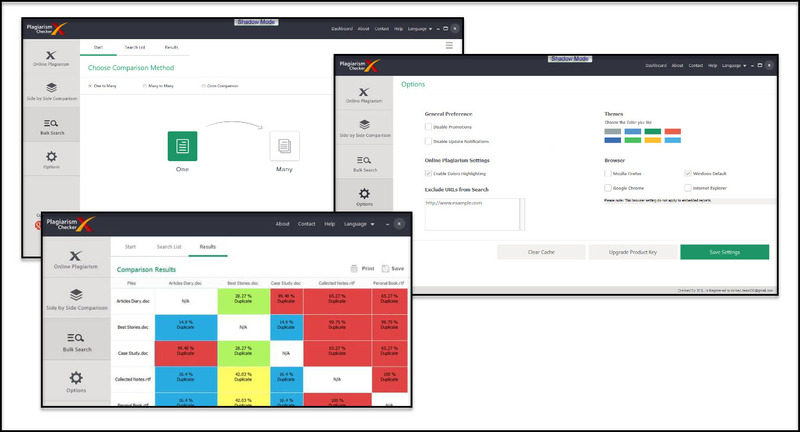 A unique and exclusive feature of an application allows a user to analyze multiple documents to determine originality within single or multiple repositories. Case in point; teachers can cross-check assignments from a whole batch with just one-click. 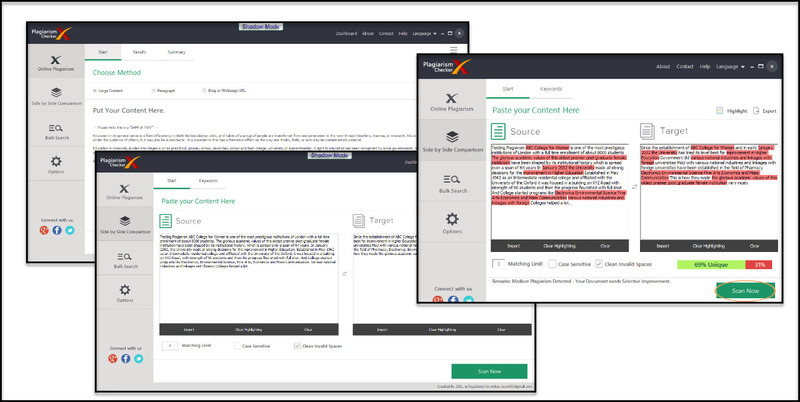 Advanced algorithm cross-examines up to 20,000 words within one second, and providing a user with instant results. Also, comparative studies done by independent testing agencies show that accuracy is three times higher than other similar applications. None of the user-submitted content is copied, stored or sold. As of now, the only plagiarism detection tool offering this feature. The application supports all popular text-based formats incl. PDF, DOCX, DOC, RTF and HTML. Furthermore, it is compatible with all available Windows editions. The application currently supports seven languages, i.e., English, Spanish, French, German, Italian, Dutch and Portuguese, with full functionality. An intuitive way of understanding results within a glance. Contact us anytime from anywhere, to talk to one of the customer representatives. Available just for users, around the clock. New bulk search import URLs from clipboard feature and improved save menu and other export options. Changes to the design and few minor fixes along with application exit notification feature. New dashboard added to the software which shows the already scanned reports and lots of other statistics. Also, there are so minor language other fixes. Improvements in the reports and browser selections. Improvements to the links navigation in reports section, matching limits and few other minor issues. Bulk search has feature has been added a cross-check URLs feature. It enables users to compare various URLs against each other. Many performance related issues also fixed. Nice you came through for him.Well done. It looks like your subscription has been expired. @bayaz I am still using this version last few days, and I do not have a problem with the expiration. Did you use it before with a particular email? You can either change the fake **** to login or delete "Update.exe" inside the root directory and block with the firewall. That should resolve your problem. Another option is to try the newest version as suggested above but the crack is doing the same, and it is possible to have the same situation. By AVG I guess you mean on antivirus? Well, try to put the "Plagiarism Checker X.exe" file in the exclusion list and try again! The executable file is blocked by AVG! It is false positive! See the Virus Report in the main thread! I did not have a problem with Eset! By putting the .exe file in the exclusion list of AV, a user do not limit the access to the internet. It only excludes them from the analyses and program detecting the plagiarism without any issue. That is the purpose! I tested and worked fine!